COBAVER-VS publishes a newsletter once a year in spring. The newsletter includes information on current projects in collaboration with our partners and recent quality assesment results concerning the resource we are committed to protecting: water! The newsletter is distributed automatically to all COBAVER-VS members through the mailing list. Join us! PHOTO COURTESY: Josiane Farand, photographer. PICTURED FROM LEFT TO RIGHT: Emily Sinave (Project Manager of COBAVER-VS) Julie Cyr (Executive Director of COBAVER-SV), André Gendron (Head of the Board of the Caisse Desjardins de Vaudreuil-Soulanges), Suzane Proulx ( Secretary to the Board of COBAVER-VS) Louis-Marie Leduc (Chairman to the Board of COBAVER-VS) Hans Gruenwald JR (Founder and CA COBAVER-VS) Richard Dubois (Director, Communications and Community life of the Caisse Desjardins Vaudreuil-Soulanges). The Vaudreuil-Soulanges Watershed Council (COBAVER-VS), in partnership with the Caisse Desjardins de Vaudreuil-Soulanges, invites you to the third edition of its annual event, the “Canoeing down the river” Beaudette “to be held Saturday, April 22, 2017. Remember that last year, in spring 2016, 130 people paddled the river in the second edition. The COBAVER-VS is working to make this event an annual tradition for the Vaudreuil-Soulanges region. It should be noted that the event is perfectly in line with the COBAVER-VS mission of implementing integrated watershed management. One of the main objectives of the Water Master Plan (BDP) is to restore water access to the population. This activity both raises awareness about the potential of using rivers while providing participants with an extraordinary experience. 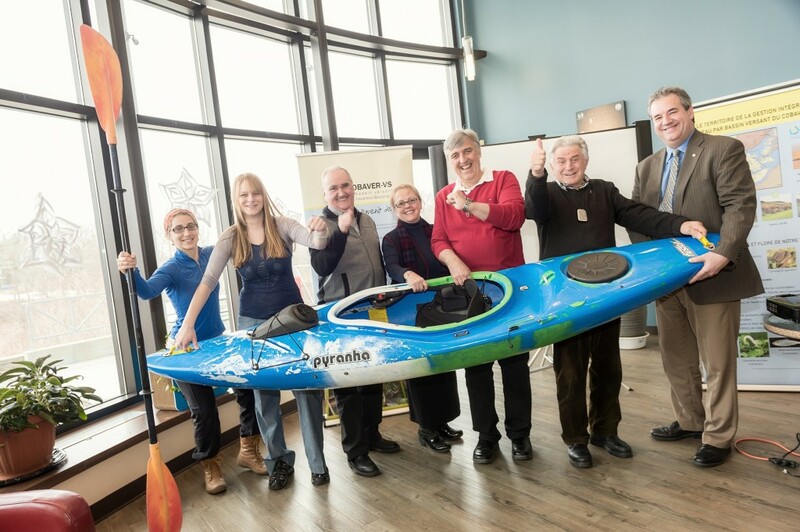 In addition to the Caisse Desjardins de Vaudreuil-Soulanges, the COBAVER-VS would like to thank the partners of the event, including the Municipality of Rivière-Beaudette and its Recreation Committee, the Châteauguay River Basin Conservation and Development Corporation. 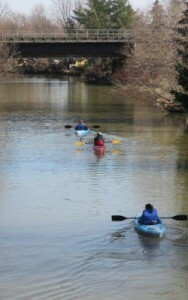 (SCABRIC), The Abbey Inn and the Quebec Canoe and Kayak Federation. The 20km course will start at Glen Nevis in Ontario and will end in the village core of Rivière-Beaudette. You must know that the Beaudette River is an excellent watercourse to learn paddle sports (canoe and kayak), because its slope is low and its rapids are very easy level. The activity of April 22 is for people aged 12 and over, beginners or experts. The COBAVER-VS will also offer low-cost rentals ($ 20) for canoes and kayaks in limited numbers (participants are encouraged to bring their own boats). Registration cost $ 10, includes a snack on arrival and a bus shuttle to return to vehicles. Interested parties are invited to register by April 14 on this website or by email at dg@cobaver-vs.org or by phone at 450-451- 0755. Vaudreuil-Soulanges, February 25, 2016. The Vaudreuil-Soulanges Watershed Council (COBAVER-VS) received the official letter from the Minister of Sustainable Development, Environment and the Fight Against Climate Change (MDDELCC) ), Mr. David Heurtel, attesting to the government’s approval of the Water Master Plan (PDE) for the Vaudreuil-Soulanges region. As a result of the evaluation of the BDP by the departments concerned, it was recognized that it met departmental expectations and is consistent with the principle of Integrated Water Resources Management (IWRM). This PDE, which was developed in consultation with water stakeholders in the region, marks a crucial step for the implementation of IWRM for the Vaudreuil-Soulanges region. The PDE is a decision support tool for all stakeholders in the community to reduce the negative impacts on water and associated ecosystems. Indeed, it makes it possible to study the current state of the water resources and to raise the problems to bring solutions in a concerted and durable way. Through clear objectives, several actions are thus set out in order to preserve or restore the uses of water on the territory. Consultation with local stakeholders made it possible to become aware of water concerns, both in terms of its use and its protection. The role of the PDE is to guide and guide in a coherent way the actions and the interventions of the users of the territory. Its acceptance by the government allows the transition to implementation by aligning the efforts of all partners. The PDE is divided into four parts. It is primarily a portrait consisting essentially of an environmental characterization of the territory. Then, a diagnosis is conceived to expose the problems concerning the water resource and the uses associated with it. From this diagnosis arise the stakes, the orientations and the objectives to be reached and finally, the action plan relating the priorities of actions and the indicators of follow-up of the implementation. COBAVER-VS’s PDE has identified four major challenges: water quality and its impact on health; the integrity of aquatic and riparian ecosystems; the quantity of water and the security related to river dynamics; and accessibility to water and recreational tourism activities. From these stakes, 15 orientations and 22 objectives result, resulting in 36 concrete actions subdivided into 3 to 5 stages to achieve the objectives set. The monumental task of developing a BDP could not have been accomplished without the help of the many indispensable COBAVER-VS partners and collaborators. Like the 40 watershed organizations in Quebec, the COBAVER-VS is an organization mandated by the MDDELCC through the National Water Policy, the Reference Framework for Priority Watershed Organizations and the Watershed. Law affirming the collective character of water resources and aiming at strengthening their protection (Law 27).